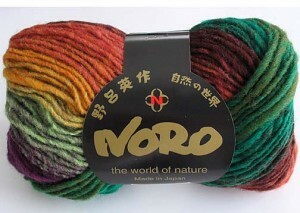 I have to admit it’s been a while since I have thought about Noro yarn. It’s always there, like a colourful friend, but I haven’t considered the possibilities recently. Of course, this is pre-POP. Emily’s colourful blanket has re-awakened a love of colours and stripes and rainbows! We just received a new shipment of Kureyon (the yarn Emily used for her pretty piece) as well as the Cascade eco for the white background. We received some wild colours, perfect for a POP of bright and cheery. 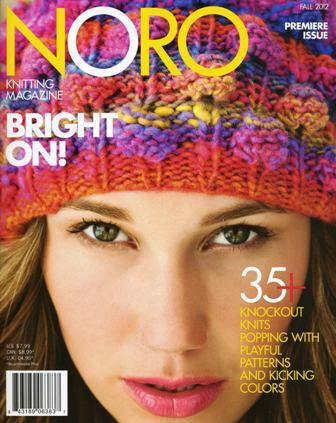 Noro has also released their very first magazine issue. It’s full of both wear-able designs and of course, some wild and crazy because it wouldn’t be Noro without some wild and crazy right?! The best part of the mag for me was definitely the article on the beginning of Noro and the wild and crazy tea cozies!